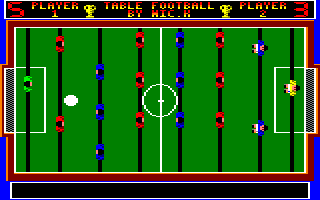 Table Football is a table-top football game for two players. Player one plays the red team and player two controls the blue team. After listening to the pleasant title music, you and a friend begin the match. The controls are simple enough; move up or down and kick to the left or to the right. They respond well as the large football moves along the pitch in what can soon become a nerve-racking game. The graphics are smooth, colourful and a tad slow but overall they work well. Overall, an average but enjoyable two-player challenge that begs for a computer opponent. 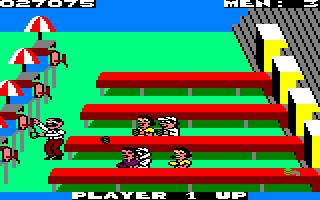 Tag Team Wrestling is a two-versus-two wrestling game. You can choose from eight different teams and fight your way to the championship. 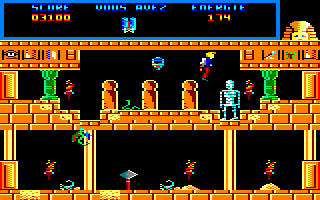 The graphics are average – not much detail on the sprites and in the background. Besides that, all the teams look the same in the ring! There is a small variety of moves; one kick, one grab, one punch, and that's all. You can also run and execute a flying kick, but you will never hit the target. The gameplay suffers; you will probably be badly beaten by the computer, and because of the small variety of moves, you will become bored easily. The sound is almost absent, just like the grab factor. Overally, this game is light years behind WWF Wrestlemania and it is a hasty job. The evil Sultan of Saladin has captured Prince Imrahil's sister and taken her to Baghdad, and you must rescue her. 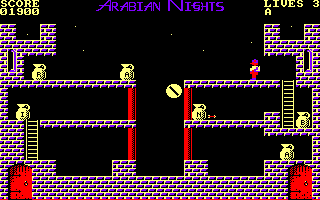 Starting on one of the Sultan's ships, you must collect seven jugs in the correct order, spelling out the word 'Arabian', before you can travel along the river Anhil to a cavern, where you encounter some genies and must again collect seven jugs. Once you've done that, you fly across the desert to the gates of Baghdad to – you've guessed it – collect seven more jugs. This is a mediocre platform game that has dated badly. The graphics and music are fairly primitive, but the collision detection is poor and ruins the game completely, and the second and fourth levels are far too easy. The Talisman of Osiris is a sacred artefact that bestows magical powers upon whoever possesses it, and secret agent Karl Adrix has been sent to explore the catacombs beneath the pyramids and retrieve it – but in order to enter the room where it is located, he must obtain four jewels and place them next to statues of the gods to appease them. Once all the jewels are placed correctly, he will receive the key to open the chamber where the mythical talisman is located. This is the second in a series of six games starring Karl Adrix, and it looks and plays very similarly to the first one. Even the same music is used; the only significant difference is the Egyptian-themed graphics. It's just as enjoyable to play as the first game, although there are some rooms where you can fall into a trap and be unable to escape, which is annoying. See also: Le Crépuscule du Naja, 20000 Avant JC. 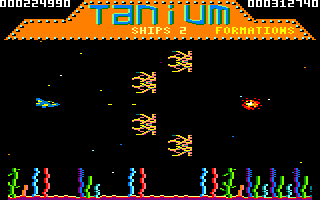 Another horizontally scrolling space shoot-'em-up to look at and play. What's this one like, then? Erm... it's not that good. Just control your spacecraft and fire at the oncoming waves of aliens, spaceships and rocks, while facing the occasional large alien which will take a lot of shots to kill, and collecting a few power-ups on the way (which seem to have little effect). I've seen it all before. The graphics are OK – they're rather colourful – but the sound effects are rather basic, and the scrolling is relatively slow and jerky. 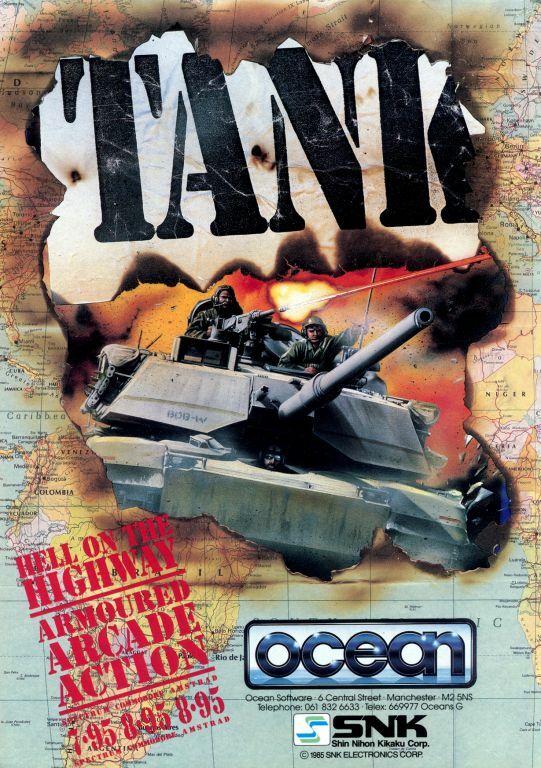 Tank is a shoot-'em-up based on the SNK coin-op game. The evil dictator has gone way too far, and it's up to you to make your way through his defences and put an end to his régime. This entails travelling over (very large) beaches, jungles, villages and military installations while shooting everything that moves. Your tank is initially equipped with machine guns and a cannon, but there are various letters scattered around which power up your armoured vehicle. Enemies come in all shapes and sizes with some very tricky bosses to defeat. 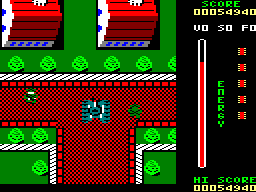 The graphics are varied and colourful, with jumpy scrolling that doesn't spoil the game too much. Apart from the short tune playing on the title screen, the in-game effects are limited to shots and explosion noises. Tank is easy to get into and it gradually gets more and more difficult. 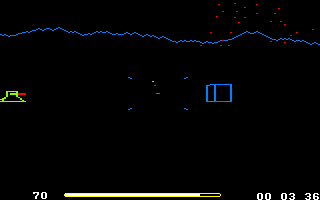 You've somehow been marooned on another world and have to shoot all the blue objects to escape. However, there are tanks who are out to get you, and each time you shoot one, another will appear. 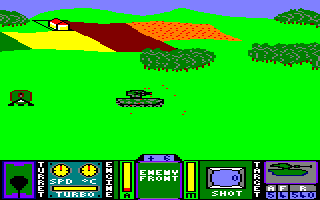 On the screen, you can see a radar map showing the location of the tank and any missiles it fires. Unfortunately, since the graphics are so minimal, finding that last crystal can be frustrating, but in fact you should be able to complete any game in under ten minutes. Despite it being one of the easiest games I've played, there's still something about it which makes me go for it whenever I feel like a quick blast. Your mission is to rescue agents stranded within the battle zone. You travel in your tank, crawling over many types of terrain in a 2D map setting. Enemy tanks, trucks and turrets lie in wait, and when sighted, pressing the fire button activates the battle mode. Here the game changes to 3D view where you elevate your gun to the correct angle in order to score a direct hit. The loading screen is well drawn in MODE 1, making good use of colour. Game-wise, the graphics for the map are varied and colourful. 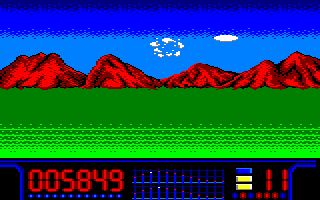 The battle mode is also detailed, displaying mountains, hills, fields, etc. Sound effects are limited to shots and explosions. An interesting game that carries just the right difficulty level. Can you help the bartender serve all the customers as they flow continually into your bar? The bar consists of four long tables, and customers move along the tables. Once any of them reach the bar, you lose a life, and the way to avoid this is to throw a mug of beer along the table to the customer, which hopefully will send them out of the bar altogether; if you completely clear the bar of customers, you go to the next level. You also have to collect empty mugs as the customers throw them back to you. The action is frantic, but the controls are rather unresponsive when there is a lot of action on the screen, and by the third level, the amount of customers becomes so overwhelming that it seems to be impossible to progress any further. Still, it's an entertaining game with colourful graphics. As the name suggests, this is a target shooting game that requires MHT's Gunstick; you can't play this game without it. There are two games you can choose from. In the first one, you must shoot insects and prevent them from eating a chicken that is sitting on a table – yes, you read that correctly. The pace is rather slow and boring, and it's a silly idea anyway. The second game is a clay pigeon shooting session in which discs are thrown into the air and you must shoot them to score points; the further away they are, the more points you score. You won't play the first game for long, but the second game is a bit more interesting.